With the Rhino 5200 you'll get great results in less time every day-- thanks to the new features. The RHINO 5200 meets all ANSI, TIA/EIA-606-A labeling standards. It runs on 6 AA batteries or an optional, rechargeable lithium ion battery that reduces AA battery waste and expense. The RHINO 5200 also features a battery-life indicator and auto-shutoff to maximize battery life . The portable, affordable Rhino 5200 is the ideal label printer for datacomm, electrical, audio/visual, security, MRO, construction and broadcast professionals. It?s the perfect labeling tool for work in real-world jobsite conditions. Order yours now! RHINO labels stick to curved, textured and highly textured surfaces in heavy-duty environments. Use flexible nylon or heat shrink tubes for wire and cable marking, permanent polyester for flat and textured surfaces and metallized permanent polyester for asset tagging and other general needs. Also available in vinyl and non-adhesive tags inserts. All are easy to peel, with a split-back design. Select from five materials in as many as four widths: 1/4" (6 mm), 3/8" (9 mm), 1/2" (12 mm) and 3/4" (19 mm). 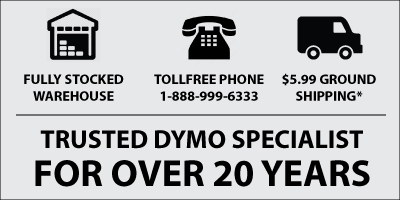 We use the Dymo Rhino 5200 everyday for labeling everything from cable to equipment racks. This label printer is very versatile, reliable and tough. All 20 of our technicians carry one and love them. We have recently started using the rechargeable battery and charger in order to save the cost of batteries.